You'll find no shortage of people telling you to exercise for health or appearance. But what about for how it can pay off in your performance in video games? Stick with us. Here's why your character wants you to get in the gym! 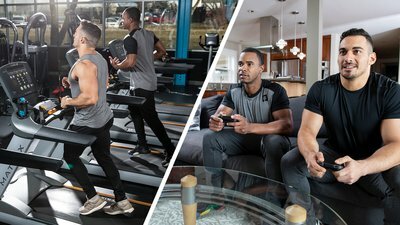 The prevailing stereotype says that gaming and fitness are opposites that definitely don't attract. Sure, somewhere around 66 percent of Americans play video games, but it's hard to shake the image of the gamer as someone buried in the couch, slamming Mountain Dew and Doritos, and chasing kills while getting unhealthier by the day. But this is one stereotype that's seriously overdue for an update. For one, fit gamers like Jackson "Bajheera" Bliton are showing that a full life has room for both serious training and serious battles, and teaching their fans to do the same. And for another, gamers are realizing that fitness isn't just something to do to balance out their screen time—it's something that can actually make them better at gaming. No, seriously! Here's how a consistent approach to fitness can pay off onscreen, and how to get started. Serious gamers know that it takes a surprising amount of energy to stay locked in for hours at a time. Decisions need to be made each and every second about where to go, what weapon to use, and what strategy is best, and it can be taxing on your brain after even a short amount of time. News flash: If your body is totally out of shape, that means you're not able to use your energy systems optimally—both mentally and physically. When you exercise regularly, with a variety of styles—aerobic (like cardio) and anaerobic (like lifting weights)—your body becomes more capable of utilizing its resources efficiently and effectively. This allows you to feel more energetic, even late into the night. More than just about any lifestyle change you can make, exercising regularly is fantastic for overall mental health. Your ability to produce and regulate neurotransmitters like serotonin, dopamine, and more are all benefited through regular exercise. This can pay off in terms of mood, but also in what a gamer might consider performance-oriented mental health—things like being able to make better, faster decisions. Sometimes getting the drop on your opponent comes down to a matter of milliseconds. One workout won't be enough to help you there, but weeks or months of consistent workouts very well could. A downside to getting really good at your favorite game is that there's pretty much no way to do it without spending more time in front of a screen or monitor. And every hour you spend there means a greater volume of what is known as "blue light" exposure for your eyes. Blue light, which is especially pronounced from backlit screens, carries the most energy of any types of light on the visible spectrum. This means it also has the greatest potential to cause physical harm. Too much blue light exposure, especially at night, can lead to problems like headaches and eye fatigue. But even more commonly, it can wreak havoc on your sleep. Yeah, but who needs to sleep? You do. As sleep quantity and quality go down, so does your mood, ability to concentrate and focus, and pretty much every other marker that makes you good at your favorite game. How can we avoid this while eliminating as little game time as possible? You guessed it: exercise. Many studies (and far more anecdotal evidence) show that exercise can improve the amount of time it takes to fall asleep, as well as overall quality of sleep. With greater, longer sleep, we see better repair of not only muscles, but also the eyes. There's no downside here. And if you're someone whose nocturnal lifestyle has made your sleep patterns a wreck, adding in some exercise may be the easiest way to get it back on track. We've all been there. The final circle is closing and there is only one enemy team left. You can win or lose in a moment, and you know you have what it takes to win. But your hands are sweating and you feel your heart rate increase. This is why you game. It's fun, but it's also stressful. When adrenaline is high, it can easily take over—with disastrous consequences for your character or your team. But guess what? Exercise can help mediate that stress response. This phenomenon is known as the "cross-stressor adaptation hypothesis," and put simply, it means that subjecting your body to the physical stress of exercise helps you cope with the mental stress of other activities. If you're someone who views exercise as pain and suffering, this is especially important to hear. Exposing yourself to small, controlled amounts of the "poison" over time is actually the anecdote! And it means that when it comes down to the final moments of a round, you'll be more mentally prepared to take on your opponent—and take home the victory. The best part about fitness? It doesn't have to be an "all or nothing" approach. Sure, Instagram and YouTube fitness culture can make it look like 24/7-swole-patrol is the only way that "counts." That's definitely not true. Looking for a place to start? Lift weights about three times a week, and do some cardio about the same number of times. They can be separate, like in the Bodybuilding.com All Access program Total-Body Strong, which counters three full-body workouts a week with walking for cardio. An even more time-efficient approach is something like Hannah Eden's FYR or the at-home fitness plan Home Body, both of which have sweaty workouts that combine strength and cardio together. But it doesn't have to be something as systematic as a program, at least at the start. You could simply find a workout that works for you, like Bajheera's Upper-Body Pump Workout, and add in some walking to go along with it. You may not be amazing at first, but as you get deeper into exercise, you'll also find that getting better at it is a lot like, well, getting better at gaming. "It's the grind," explained Bliton on the Bodybuilding.com Podcast. "Be willing to put in a lot of effort over a long period of time, and understand that's gonna take effort. It's gonna take improvement." Find what speaks to you at the level you're at now, and just start doing the work. There's no telling where it'll take you, or how it will pay off, both IRL and on the virtual battlefield. Nielsen Games. (2018). Games 360 US Report. Downloaded March, 25, 2019. Tosini, G., Ferguson, I., & Tsubota, K. (2016). Effects of blue light on the circadian system and eye physiology. Molecular Vision, 22, 61.
von Haaren, B., Haertel, S., Stumpp, J., Hey, S., & Ebner-Priemer, U. (2015). Reduced emotional stress reactivity to a real-life academic examination stressor in students participating in a 20-week aerobic exercise training: A randomised controlled trial using Ambulatory Assessment. Psychology of Sport and Exercise, 20, 67-75.